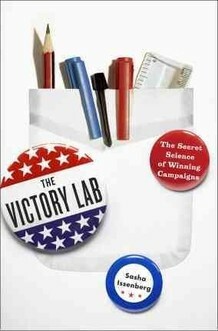 The Victory Lab, a copy of which was kindly sent to me by Crown Publishing, tells the story of how academics and computer experts have gradually come to play a major role in the way political campaigns in the USA are run. It features a cast list of political scientists, campaign managers and statisticians who, between them, have come up with a cornucopia of analytical techniques and tools to determine whether you vote, how you vote and, more importantly, how to get you off your sofa, into the polling booth and putting your mark against their candidate’s name. On the whole, it is a fascinating read, taking a historical view of vote analysis and showing how tools and techniques have been introduced and refined over the years. As is to be expected, there is an emphasis on recent campaigns, particularly those of Bush Senior, Clinton, Bush Junior and Obama and it is the last of those in particular that are of special interest, given that, as this is posted, America will be about to go to the polls to choose between President Obama and Mitt Romney. Although one of the criticisms of The Victory Lab is the way it jumps from topic to topic without a great deal of connection, one of the key underlying themes is the shift from precinct based analysis, in which all voters within a single political unit are, essentially, treated the same, to the concept of micro-targeting, in which analysts can identify individual voters in otherwise unpromising locations who are worth spending time on. Micro-targeting also allows for very specific messages to be crafted for small sub-groups of voters for whom not all of a candidate’s views may be well received. Underpinning this shift is, of course, the rise of the computer and of processing power, which allow the analysts to process huge quantities of data through their algorithms, enabling them to measure human behaviour and identify exactly which voters they need to get out on the day, as well as how to do this. The first Obama campaign appears to have been the apotheosis of this approach, using the available analysis to create a kind of mass-participation campaign hitherto unfamiliar to US presidential campaigns. Some of the details of this campaign are truly amazing, including the mind-boggling view of a senior Obama aide that the computer models had become so sophisticated that, for undecided voters, the computer could determine which way the voter would jump even before the voter knew. What is also notable from the text is how little the candidates themselves appear to be involved. Although they, and their manifestos, set the framework, it seems that the voting models and persuasion techniques operate almost independently, although this impression may be distorted by the focus of the book. There is also very much of a flavour of an arms race between Democrats and Republicans, with each side eagerly adopting innovations made by the other side and ramping up the money and resources given to this new breed of political operative. The Victory Lab is a truly fascinating book that I would highly recommend to anyone with an interest in the machinery and process of politics. In a way, it is a shame that I am currently disenchanted with pretty much every British political party as I would very much have liked to deliver a copy of this book to my preferred party. As I suspect the UK is behind the US in this kind of thing, it would be interesting to see how the tools could be adapted to a British general election and what kind of effect they would have on what is likely to be another close fought campaign. This is a really excellent review! You make a good point about the candidates and their involvement -- they seem disengaged with the day-to-day of campaigns, but it could be just that microtargeting is such a specific and nerdy part of campaigns that candidates don't have much interest in it.